After injuring his back and pelvis in a skiing accident Cody fell victim to poor habits. Read on to see how he took control of his diet and nutrition and got himself back on track! 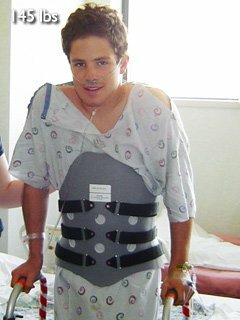 In March of 2004 I was involved in a skiing accident that left me with a broken back (t12 burst fracture & t3 fracture) and a broken pelvis (2 fractures on the left side). I dropped from roughly 160lbs to 145-150lbs within 2 weeks after the accident. 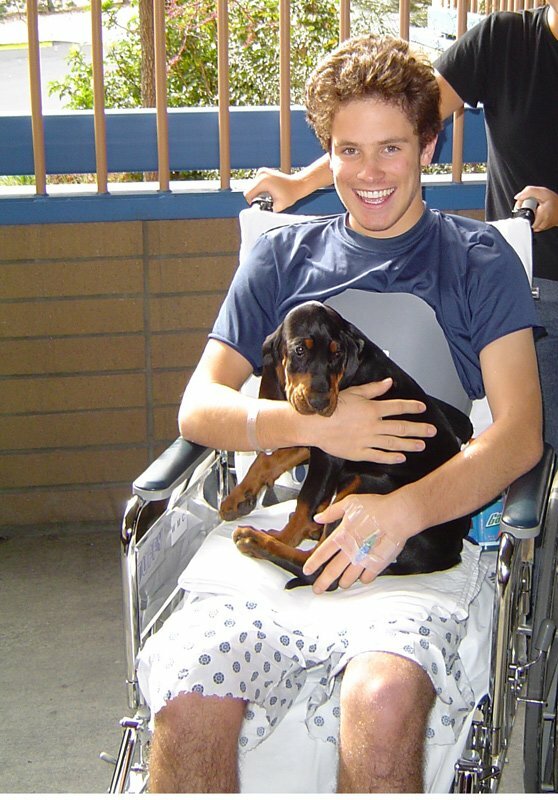 The best part of the healing process was that I was lucky enough not to require surgery to fix my injuries. I was, however, in a TSLO for 5-6 months after the accident. 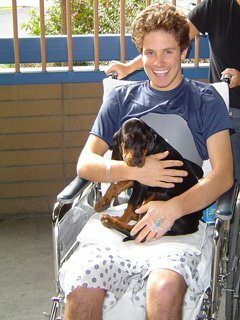 Therapy/rehab started with getting out of bed and sitting in a chair, unsupported, for 5 minutes and ended with me being on the swim team in high school; a journey that took 10 months. The intermediate stages of rehab involved a lot of stretching, core strength exercises, and very light weightlifting. Surprisingly, the weightlifting during rehab was not enough to get me hooked on the bodybuilding lifestyle. The healing process was as follows: I could walk without crutches, a stroller, or wheelchair after 3 months (June) at which point my pelvis was healed but still not fully recovered. I had muscle atrophy and minor nerve damage. core strength exercises, and very light weightlifting. I got a full release from the doctor 10-11 months (January) after the accident at which point my back had stabilized, the bone healed, my t12 vertebra had naturally fused with the vertebra above it (t11 I think) and the soft tissue could support most normal daily activity. However, even 7 years after the accident, it is apparent I will likely never be back to 100% or the way I was before the accident. I continued playing sports (soccer, lacrosse, swimming) until I finished high school, however once I got into college I put on some weight over freshman and sophomore year due to inactivity and poor eating habits and got up to 180lbs. Luckily, I realized I was headed down a slippery slope and cut my weight back down to about 160-165 pounds by swimming 4 days per week. Unfortunately, family, friends, and my girlfriend (ex now) told me I looked skinny, sickly, and frail ... the criticism combined with the thought of me being a slumped over, inactive, miserable 40-year-old man who couldn't play with his future kids was weighing on me. My back, legs and pelvis ached, it hurt to stand for more than an hour, I was out of shape, everyone including myself thought I was skinny, I was slightly self conscious of my body ... something had to change and my passion for taking better care of myself (bodybuilding) developed over night! I knew that if I didn't stay physically fit and develop healthy diet and exercise habits my body would quickly deteriorate due to my injury. I knew that if I didn't stay physically fit and develop healthy diet and exercise habits my body would quickly deteriorate. I just jumped in. 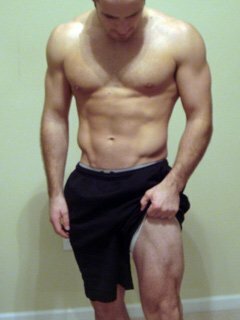 Over Christmas break (Dec - mid January) of 2008 I hit the weight room weighing in at a measly 160-165 pounds and roughly ~10% bodyfat. I was pretty clueless as to what I was doing so I lifted 3 days per week and did a "full body" routine. Since I was so uneducated on lifting, I neglected my legs and many of the big compound lifts (military press, deadlifts, squats, pull-ups, dips, bent over rows) that build a great foundation for bodybuilding, athletics, strength or just a healthier life. I spent a lot of time on arms and chest with a little back and shoulders thrown in here and there. I started making progress and saw some gains which were enough for me to stay motivated and determined but after about 6 months of these minimal gains I wised up and started reading fitness magazines (Muscle and Fitness, Mens Health, Flex, Muscular Development etc). I would follow routines and meal plans and experienced even more gains and progress. However, the gym I was working out at was at my apartment complex with limited machines and equipment. It lacked a free weight bench press station and squat/power rack. Bench press and squats were performed on a Smith Machine. Furthermore there were no adjustable barbells and the dumbbells only went up to 70 pounds. I thought I was making great gains at the time but in hindsight I could have been more productive had I gone to a real gym which I eventually did in September of 2010. My progress went through the roof once I made the jump to a real gym which had all the equipment I could ask for! Last summer I discovered Bodybuilding.com and the wealth of information that it contains. 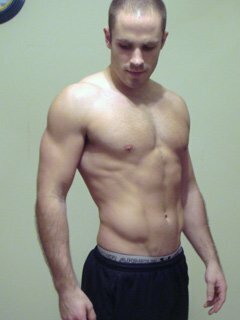 I read through articles, forums, programs, found answers to many questions, and became extremely motivated and inspired by those on BodySpace. Furthermore, the tools and interface on one's BodySpace profile served as tremendous motivation for me. Up until Bodybuilding.com I hadn't compared my own before and after pictures but when I uploaded them to my profile I discovered another wave of determination. The tools, atmosphere, and community at Bodybuilding.com provides its users with an unrivaled experience and opportunity to reach one's full potential. My progress went through the roof once I made the jump to a real gym which had all the equipment I could ask for. I use a lot of supplements and I find them as an integral part of my routine and they serve as motivation too! However, I am most proud of the fact that I have never used any (legal or illegal) steroids, pro-hormones, HGH or any other substance similar to those. All of my gains are due to eating whole foods, the listed supplements or similar variations, (vanilla vs chocolate or Jack3d vs SuperPump250), hard work in the gym, and unwavering motivation! Cutting Diet To Lose Fat: I cycle carbs with a high-low-low-high-low-low-high pattern. Here is a sample day from the high carb day. 1-1.5 gallons of water a day. Bulking Diet To Put On Weight: This is the diet I used to go from 176 pounds - 195 pounds in 3 months. The program that has yielded the best results for me is Linear Periodization. When I combined this program with a healthy meal plan I gained 20 pounds in 3 months, my strength increased substantially and I felt great! Here is a sample week during the 3rd phase of the entire periodization routine. I found this program in the pages of Muscle and Fitness in the November 2010 issue. It was created by Jim Stoppani PhD and is one of several programs of his I have followed. This particular program cycles from high reps (15-20) and light weight down to low reps (3-5) and heavy weight. Every two weeks the user advances to another phase subjecting their muscles to more stress which prevents plateaus. Be patient and realistic…your gains will come with time. Find a source of motivation and utilize it … be on the lookout for other sources (music, a picture, a video, a movie, someone's criticism or compliment…ANYTHING). Eat healthy and Train hard. From my experience, meal plan/diet/food has been the biggest contributor to my progress/gains. Cook, prepare and plan your meals in advance! Keep things dynamic (diet/workout routine). Educate yourself or at least get a subscription to a fitness magazine. Take progress photos and measurements of yourself - huge motivation.